After a showstopping visit in 2017, The Knitted Bible Stories Exhibition returns with extra stories, all beautifully handcrafted from wool by members of the knitting group at the Salvation Army church in Warrington. 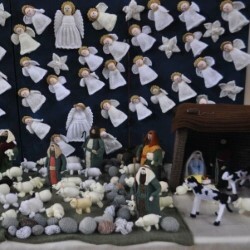 This large-scale exhibition contains well-known stories from the Old and New Testaments, brought to you by a cast of hundreds of knitted characters. Prepare to be moved and amazed! A bonus knitted World War I exhibition, created last year to commemorate the centenary of the end of the war, will also be on show.